at Serendipity Stamps! He´s so cute! Idag bloggar jag på Pysslotekets blogg. Jag har gjort två julkort med gran diesen och använt Distress Markers för att färglägga. Titta gärna in på Pyssloteket, det finns massor av fina saker där! I´m enjoying my new fall stamps from Penny Black! Lots of beautiful images and dies! My tutorial for making faux marble on SCS MIX-ability challenge this week! "FACE THE MUSIC AND DANCE"
I thought of Dancing leaves and created this card with some notes in the background! The stamp set from Greenhouse Society stamp club for September is so lovely! 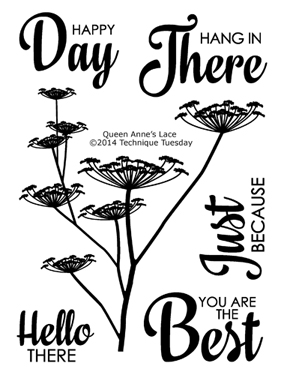 My samples with "Queen Anne's Lace"
Idag bloggar jag på Pysslotekets blogg! Två kort, ett i guld och ett silver! Titta gärna in i Pysslotekets shop, där finns massor! Some cards with the lovely Christmas stamps and dies from Penny Black! A card with the sweet girl from Penny Black! Ain´t she sweet..? I think this stamp Tulip Vase from Serendipity Stamps is so beautiful! September and time for reflection..;) Two cards with trees from Penny Black!